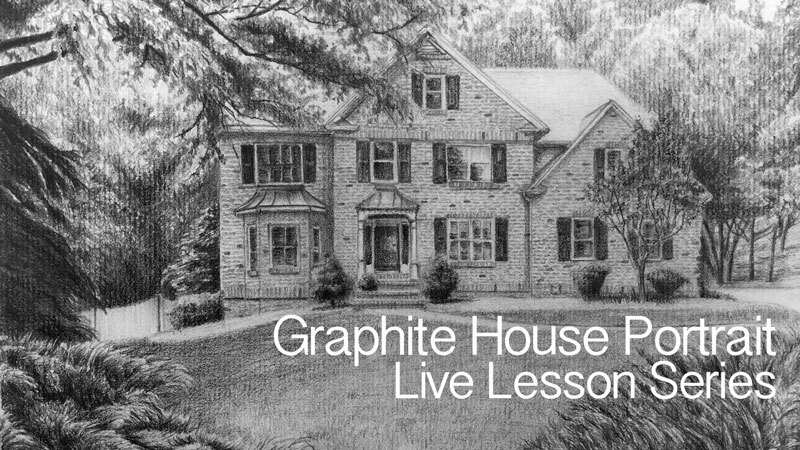 A nine-part lesson series on drawing an accurate house portrait with graphite on textured charcoal paper. Learn how to layout the house using comparison techniques and create convincing textures with graphite. Each step of the process is presented with instruction along the way. I’ll keep the homework that I complete to a minimum in the early stages of the drawing. Interesting to see the diligence doing the bushes. Sometimes, it seems, family & friends would have you think your “compulsive” and it is good to see here that it is more like diligence. I think it helps keep self-doubt from hampering the learning process. Thanks! Yes, it is a slow process – but well worth it in the end. Hi Matt, I just wanted to tell you that I sent you an email about 3 weeks ago but didn’t get a reply from you yet so I sent you 2 additional emails regarding my 1st email last week and they are really important! Did you get them by any chance? Before, you were usually faster in replying to emails so please let me know …… Thanks! I replied to your email and was wondering if you got it, since there was no reply back. The last email from me was sent on February 15. I’ll send it again, but you may check and see if you received it. Oh, I bet that’s it. Thank you. Matt, While digital painting might be interesting to watch, it’s not something I would spend time doing. Continuing to enjoy all your lessons – live and taped – over here in Tunisia! Could you explain why you use charcoal paper. Charcoal paper has a unique texture – it is a laid paper. This unique texture works well for developing certain textures like the trees and bushes in a house portrait like this. It also gives the finished drawing a unique look. Just because the paper is labeled as charcoal paper doesn’t mean that you can’t apply other drawing mediums to it. I am learning Photoshop. It would not replace traditional art for me but I find I really enjoy learning what it can do. I was especially surprised to find the artwork that was possible using the “brushes”. I would find a Live Lesson quite interesting. It seems to have potential as another learning tool in working value, light, & color. My feed keeps cutting out but my internet connection is fine. The videos are set to play in high definition by default. If they are freezing on you, then you’ll need to turn the HD off. To do so, scroll over the video and click on the “HD” icon. Although your internet connection may be stable, streaming in HD requires a fast connection as well. Do you lay your drawings flat on a desk or have it tilted? I prefer to work at a slightly tilted angle. By doing so, it prevents any distortion that may occur from looking at the drawing on a flat surface.